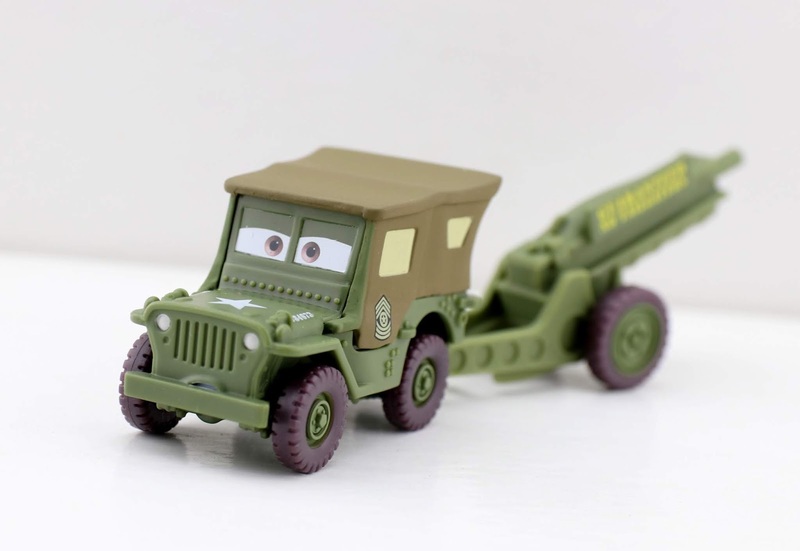 Hello Disney·Pixar Cars fans and collectors! Welcome to another Mattel 1:55 scale diecast review. It's been a while since I posted one of these, so it feels good to be documenting my Cars collection again. I have a lot to catch up on from this year (and even some from last year still, which is just crazy) so I hope to be putting these reviews up more regularly. Today I'm taking a look at a release from this past summer (which hit shelves around May/June in Case K), Sarge with Cannon! 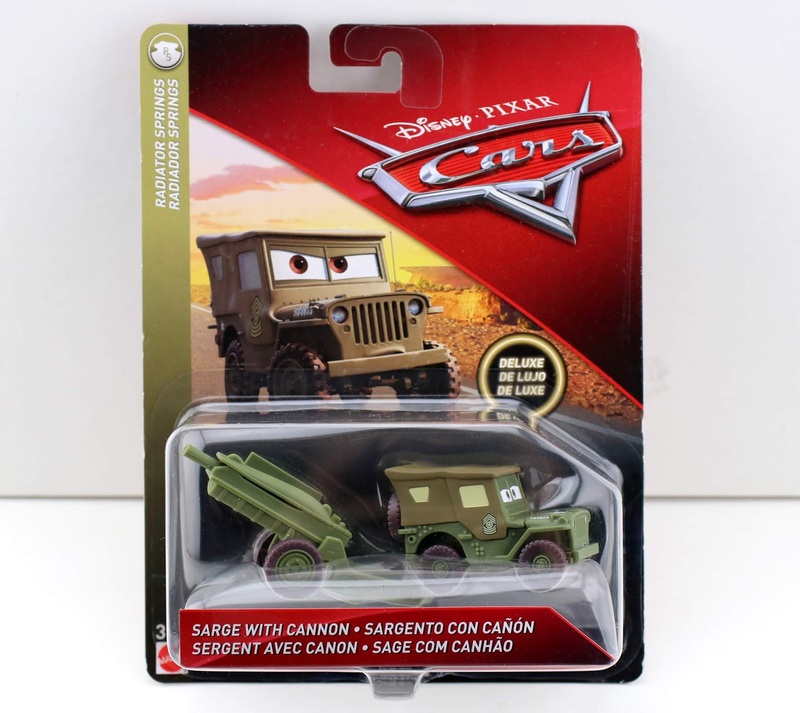 Sarge here is a Deluxe sized vehicle from this year's "Radiator Springs" sub-series. What's interesting is that this one was actually suppose to be released clear back in 2010, but it was cancelled! Pretty neat we finally got it all these years later. What makes this diecast oversized/considered Deluxe is not Sarge himself (he's the standard size), but the addition of the cannon accessory. As shown in the screen shot above, Sarge is seen with this "Guaranteed No Tailgaters" cannon (such a clever gag by the way) in the original Cars film during, what I call, the"Route 66 montage" (when McQueen begins helping all the businesses out in Radiator Springs). McQueen is seen in Sarge's Surplus Hut wearing night vision goggles, a diecast which was also released years ago (full post HERE). Sarge has an entirely new facial expression but, to be honest, this could have been done better. He looks a little confused or dumbfounded. I wish he had more of a stern expression (like the original Sarge diecast) or one that matches his face in the scene more accurately. Not a huge deal at all, just something I noticed. 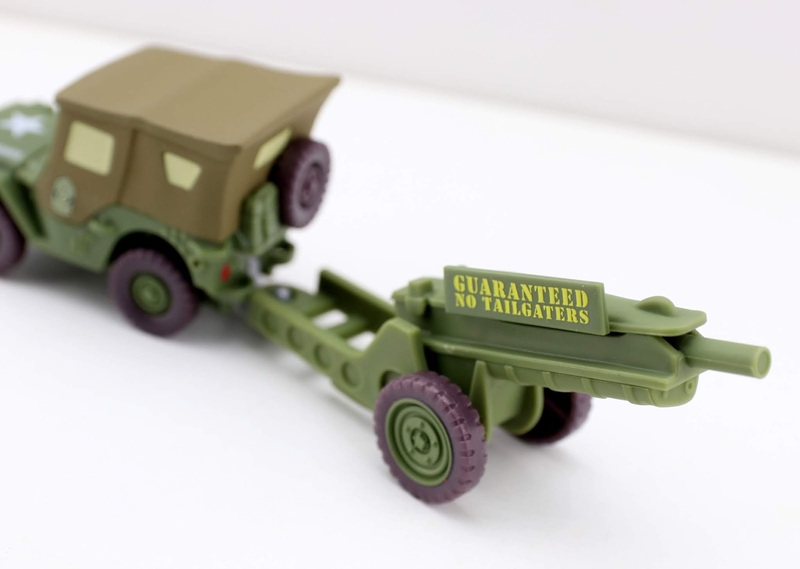 The cannon gets attached to the hitch on the back of Sarge and can easily be popped on or off. It's a great accessory and looks exactly as it should. Awesome details. You may or may not be able to still find Sarge with Cannon in your area, so definitely visit your local Walmart or Target to check if you're looking to add this one to your collection. You can also find it on Amazon using the direct link below or on eBay HERE. Happy hunting! Let me know your thoughts down in the comments. Back in 2005-2006, Disney held an 18 month long celebration (dubbed "The Happiest Celebration on Earth") commemorating 50 YEARS of Disney Theme Parks and Resorts. During that time, everyone wanted to get in on the action. Even Kellogg's Cereal partnered up with Disney with a really fun promotion. 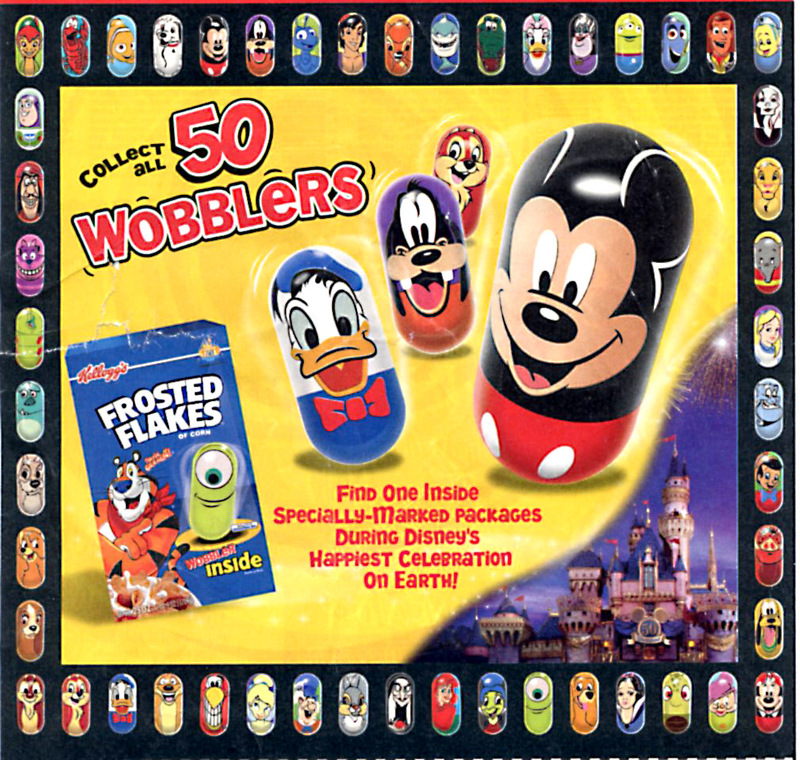 Within each box of specially marked cereal was one Disney character inspired "Wobbler" toy! Many of you I'm sure will remember this campaign and probably have a bunch of these yourself. There were 50 different classic Disney and Pixar characters to collect, each designed by artist Matthew Colrain (you can see them all on the ad below). 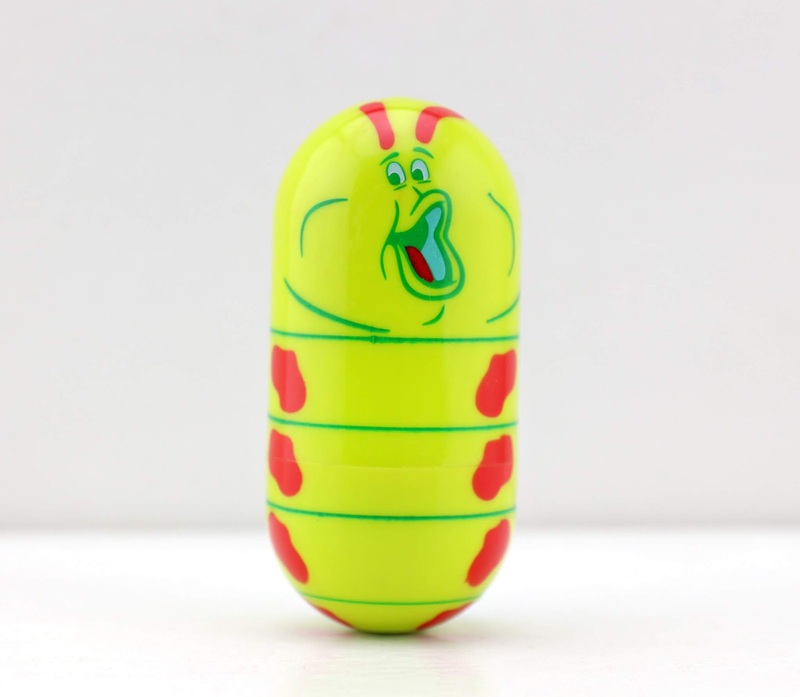 As far as Pixar characters specifically though, there were 11: Buzz, Woody and an Alien from Toy Story, Heimlich (seen here) and Flik from A Bug's Life, Mike and Sulley from Monsters Inc. and Nemo, Dory, Bruce and Squirt from Finding Nemo. Each Wobbler is 3" tall, made of a hard plastic and is bottom heavy to allow them to, well, wobble. Check them out in THIS nostalgic TV commercial from 2005. I don't remember ever getting any of these at the time, but I sure missed out! This one was given to me recently by one of my Disney Store managers before I left. It was a super fun and thoughtful little surprise to get! 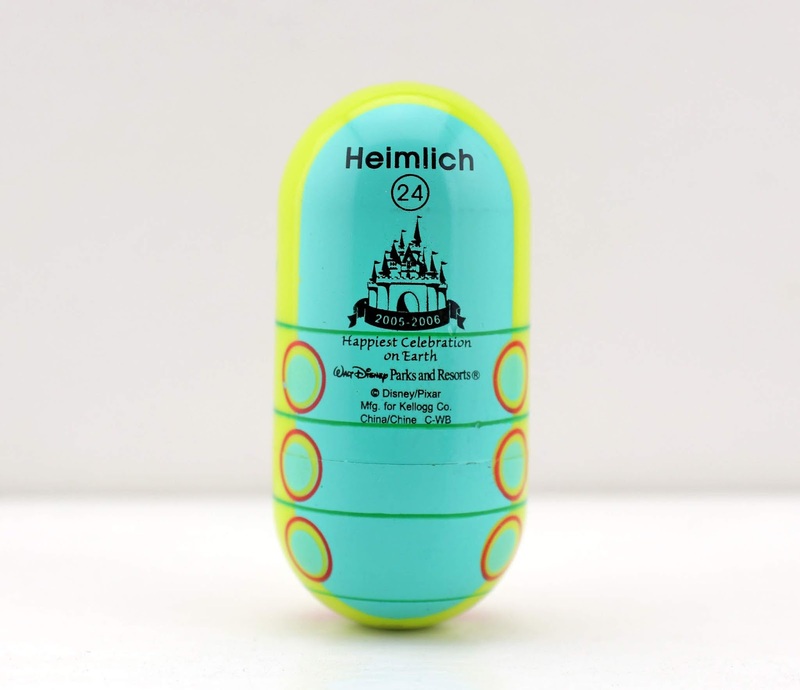 Plus I love Heimlich, he has to be one of my favorite Pixar characters. I wish they would still make cereal prizes this fun! Do you remember these? Did you get any back in the day? If so, which ones? I'd love to hear your thoughts/memories down below! And if you're interested in finding any specific ones all these years later, don't worry. There's a bunch on eBay. Check out THIS DIRECT LINK to current listings! See you real soon for more reviews from my Pixar collection!